At Inman News’ Real Estate Connect San Francisco, Sherry Chris, president and CEO of Better Homes and Gardens Real Estate, led a robust series of discussions with dynamic brokers from across the country to a packed room discussing key issues that brokers currently face. The overall theme of the Broker War Room session was “What Matters Most,” and was segmented into three areas of content regarding agents, business operations and the end consumer. Joshua Tanner, president and CEO of Better Homes and Gardens Real EstateGenerations, spoke about the value his brokerage finds in hiring new agents. In his opinion, less experienced agents may not have established habits that fit within the company’s culture. When hiring experienced agents, you must ensure that they believe in your environment wholeheartedly. Also, when determining what agents value and what motivates them, it’s important to go right to the source. BHGRE Generations recently sent out a survey to their affiliates that showed 86 percent of their agents stay with the brokerage because of the people they work with. Synergy, teamwork and support is a main source of value agents find in the company. Tiffany Kjellander, owner of EXIT Towne & Country, added that the little things are what means most to her affiliated agents. There is never a one-size-fits-all solution to making your agents emotionally invested in your company. Do your best to make them great and understand their positive and negative sensitivity buttons. Jeff Martel, owner of Better Homes and Gardens Real Estate 43° North, provided his perspective that there are three important factors in hiring, none of which is related to the ability to “sell.” His agents need to have a strong world compass, strong work ethic and ability to be positive in the face of adversity. Hiring to these principles and your business culture creates longevity and stops the 18-month revolving door, which is counterproductive to growth. He also emphasized that you must fire agents who work against the culture, even if they are strong producers — it will allow others to grow within a positive environment. 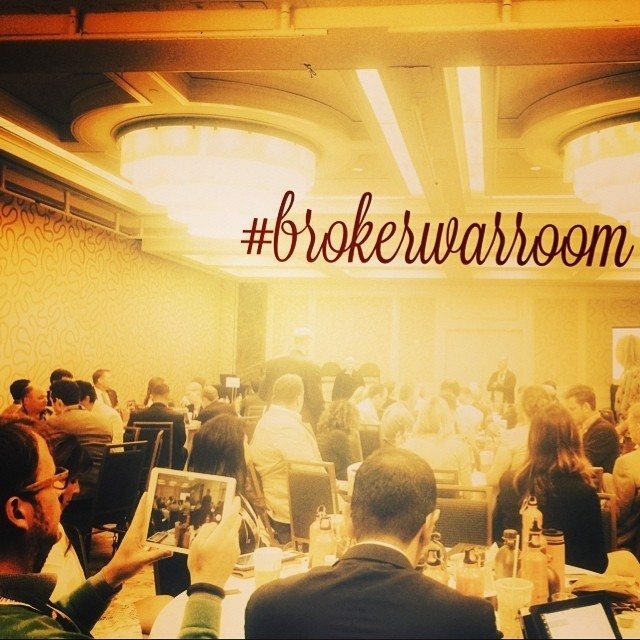 The “Broker War Room” room was packed with 100-plus broker-owners talking shop. Photo by one of the presenters, Tiffany Kjellander. Nick Segal, president of Partners Trust Real Estate Brokerage and Acquisitions, noted the importance of investing in technology. He said that 80 percent of the business you do comes from people you know. Therefore, you should invest in harnessing those referrals. Segal emphasizes not to chase your tail for the next bright and shiny tool, but instead invest in tools to help your agents get in and win in the living room. You must engage your agents on a list of tools they might want to use and then have them participate in the selection in order to determine what tools work best. We’ve all learned plenty in the trenches, and this session highlighted the best of those insights. Read more on connecting with customers, whether they’re millennials or pet lovers, by reading our latest Clean Slate post. Thanks to our amazing group of speakers for providing critical insight into running a brokerage in today’s environment. Better Homes and Gardens Real Estate is is a dynamic real estate brand that offers a full range of services to brokers, sales associates and homebuyers and sellers. Agents and brokers can network and engage with other top real estate professionals by following us at All Things Real Estate on Facebook, @AllThingsBHGRE on Twitter, and by following our company page on LinkedIn.